#G5: High Pressure/High Temperature Gas Cell. The #VP4000 is the most powerful and versatile gas sampling cell available. If you do not need all these features, the #G5 is an attractive lower cost alternative. In the #G5, we provide the same temperature rating, to 300degC with precise digital temperature control. The pressure rating is vacuum to 1000psig (69bar). Pathlength is fixed at a generally useful 5cm. The #G5 comes with high pressure ZnSe windows as standard. Windows are fully demountable and alternative window materials can be chosen to suit the exact requirements of the experiment. Two gas inlet/outlet ports are incorporated into an excellent flow path. These are formed from the same piece of 316 grade stainless steel as the cell body. And of course, no welds and no brazes ensure high corrosion resistance and integrity of construction. Connection to the cell is by 1/16" tubing through high quality 316 stainless fittings. Excellent sample flow path means the cell is ideal for stream sampling. The #G5 comes with adjustable mounting system and can be installed in the standard 2" FTIR sample slide. 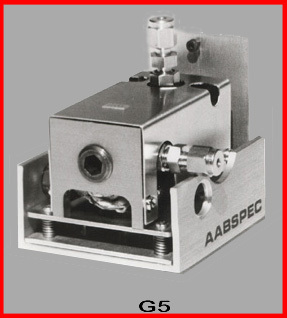 The optional AABSPEC Double Sided Mounting Bracket provides easy positional adjustment. AABSPEC temperature controlled Heated Transfer and Return Lines are available as an option for connection to high temperature gas systems. For combined high temperature plus high pressure, a special version of the cell is available with unique Aabspec Advanced Window Technology.